Michigan’s Urban Cooperation Act of 1967 allows two or more units of government to create so-called “Interlocal Agreements,” where local governmental entities can join forces to provide services like public safety, transportation and water usage without having to jump through big bureaucratic hoops or bog down the Legislature for approval. There are, to date, 999 ILAs on file with the Michigan Secretary of State’s office. A Mackinac Center review of these ILAs found several eyebrow-raising trends beyond the sheer growth in number of these agreements, including disturbing ways ILAs have recently been used. An interlocal agreement was used to force home-based day care owners and providers into a public-sector union and divert millions of dollars in “dues” to unions. There were just three interlocal agreements signed prior to 1970, and 37 by 1979. Another 108 were created in the 1980s and 121 during the 1990s. From 2000 to present, some 727 ILAs have been signed, including 91 so far in 2011. The rate of increase may be due in part to the fact that ILAs are no longer used for the sole purpose of facilitating so-called “core functions” of government. For example, 58 ILAs involve the Michigan Economic Development Corp., which itself is a product of an interlocal agreement between the Michigan Strategic Fund and “participating public agencies” such as local economic development organizations. ILAs have also been twisted in such devious ways that private residents were forced into government unions without either their knowledge or approval — and without approval from the Legislature. The Michigan Constitution specifies that only the Legislature can designate public employees. The Michigan Quality Community Care Council is the product of an interlocal agreement between the Michigan Department of Community Health and the Tri-County Aging Consortium. Created in 2004, the MQCCC touts on its website that it “offers a tool for finding, choosing, and hiring a provider.” What’s not mentioned is that the MQCCC also provided a so-called public “employer” for the Service Employees International Union to organize against and create the 55,000-member SEIU Healthcare Michigan. 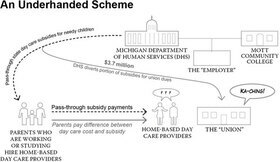 The SEIU takes union dues from the Medicaid subsidies paid to home care workers (as well as registered nurses, nursing home aides and hospital support staff), collecting as much as $6 million a year. The Michigan Home-Based Child Care Council was another such interlocal agreement, formed by the Michigan Department of Human Services and Mott Community College. Its purported reason for existing was “to improve the quality of home-based child care in Michigan.” Like the MQCCC, the MHBCCC provided an “employer” for another 40,000 business owners and independent contractors who became members of the government employee union called Child Care Providers Together Michigan, a joint effort by the United Auto Workers and the American Federation of State, County and Municipal Employees. 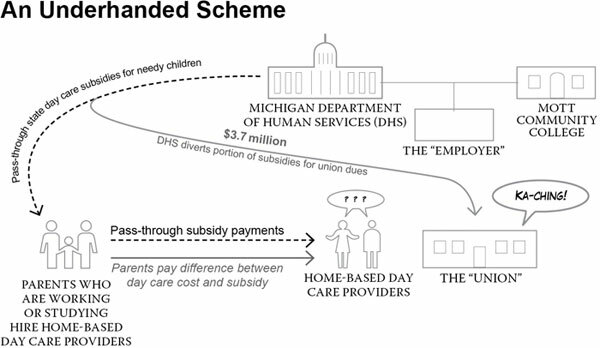 Union dues were skimmed from subsidy checks sent to day care providers on behalf of low-income parents who sought child care while working or attending school. This arrangement netted the union more than $4 million from Jan. 1, 2009 to Sept. 30, 2010. Fortunately, due to the Mackinac Center Legal Foundation’s lawsuit against the DHS over the illegal withholding of those dues, Michigan Gov. Rick Snyder effectively ordered the dissolution of the MHBCCC interlocal agreement. So make that ILA total 998. And that could drop to 997. According to a March 7, 2011, MIRS article, Gov. Snyder plans to disband the MQCCC. As a member of the Michigan House in 2010, Proos introduced House Resolution 270, which would have urged the Michigan Attorney General to take steps to beef up scrutiny of interlocal governmental agreements. The bill would also require any ILAs in the state to have biennial audits conducted by the Auditor General and be reauthorized by the governor. There may be hundreds of examples of ILAs serving the people and doing what the Urban Cooperation Act of 1967 intended. But there are tens of thousands of reasons why the residents of Michigan should be on high alert when new ILAs do more than the basic functions of government without legislative scrutiny or voter accountability. Kathy Hoekstra is a communications specialist at the Mackinac Center for Public Policy, a research and educational institute headquartered in Midland, Mich. Permission to reprint in whole or in part is hereby granted, provided that the author and the Center are properly cited.